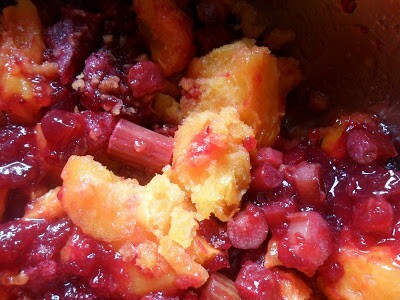 Rhubarb Cranberry Apricot Pie Filling is a nice mixture of sweet and tart. 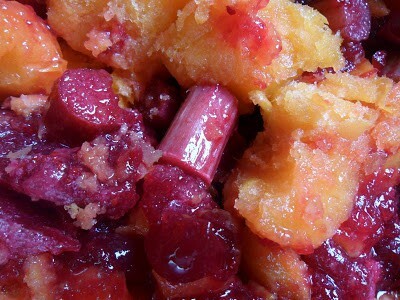 Rhubarb and cranberry gives the filling tartness and the apricots add sweetness. Combined together with sugar, cranberry juice and lime juice, the flavor is sensational. 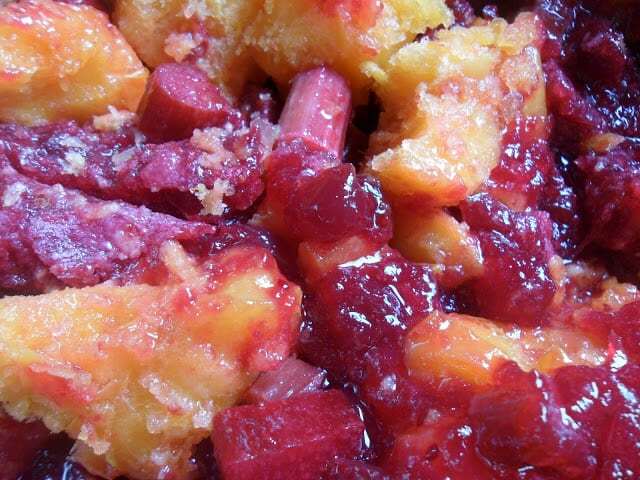 The next time a recipe calls for a fruit filling, give this recipe a try. If your recipe calls for a rhubarb filling, make this instead. This filling works great in a pie, crisp, cobbler or coffee cake. 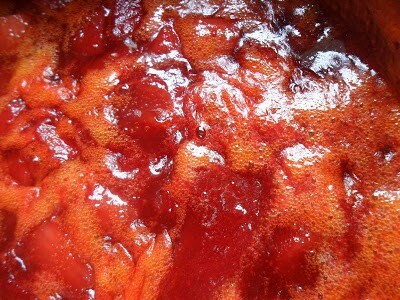 Rhubarb Cranberry Apricot Filling is a multi-purpose fruit filling. An added bonus, this recipe is freezer friendly. Make the filling following the recipe below and then allow the filling to cool. When the filling has cooled, spoon into gallon size zip-lock freezer baggies, write the date on the baggie and freeze until needed. Move over strawberry-rhubarb, there’s a new filling in town! Don’t like apricots? Use fresh peeled peaches. Oatmeal Jumble Bars is just one delicious recipe you can make using this fantastic fruit pit filling. Lemon Meringue Pie was one of my grandma’s tried and true recipes. The story goes that my grandma made my grandpa Frank a fresh lemon meringue pie daily because he won’t eat left-over pie. Now I find that hard to believe, unless of course he ate a whole pie every day?!? Hmm maybe? One thing is certain, grandma’s lemon meringue pie is sensational. I still get requests from my brother-in-law Mike to make this pie! A super easy, delicious and freezer friendly pie filling. 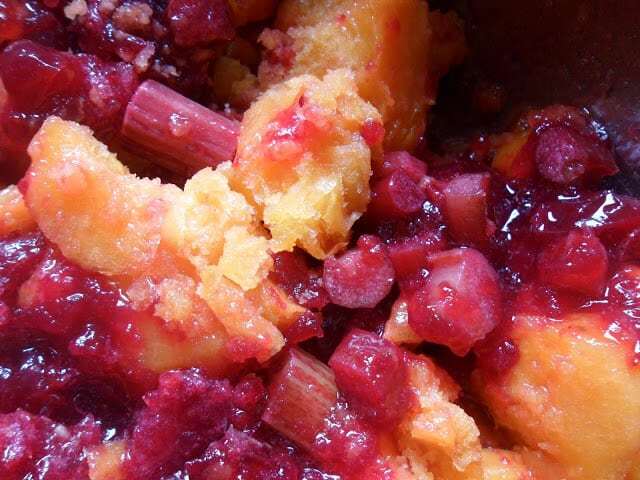 In a medium saucepan combine rhubarb, cranberries, apricots, sugar, cranberry juice, lime juice and clear gel starch. Bring to a boil, reduce heat. simmer on medium low for 10 minutes, stirring constantly until mixture is thickened. Remove from heat. Set aside to cool. Use in any recipe that calls for a fruit filling. Recipe makes 6 cups of filling. If you don't plan on using the filling right away, you can freeze it. Pour cooled filling into gallon size, ziplock freezer/storage bag. Name and date bag. Squeeze out air and lay flat in the freezer. Freeze for 6 months or up to one year. Looking for more dessert recipes? Here are a few your going to love. Frozen Mini Key Lime Pies, Easy Lemon Cheesecake Tarts and Pear Cranberry Hand Pies. Cranberries used in this recipe are from Habelman Cranberries which are proudly grown in Wisconsin. When purchasing cranberries, keep in mind that fresh cranberries freeze beautifully. Pick up an extra bag or two and freeze them to use later.